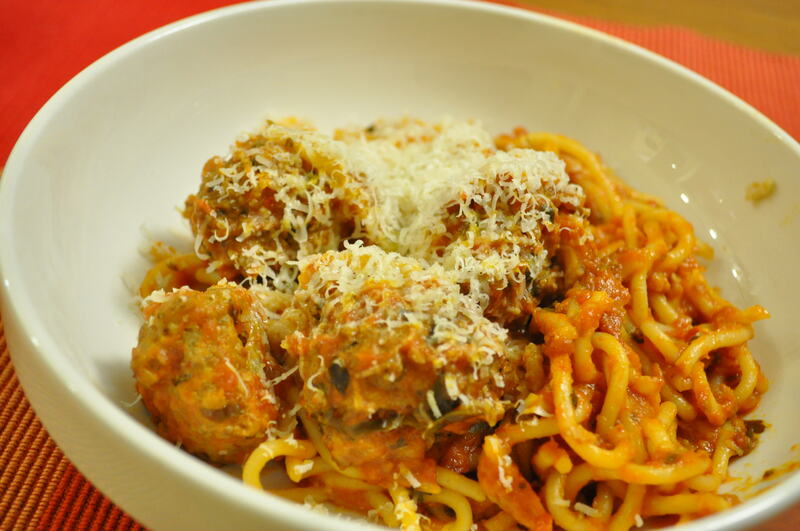 This is probably one of the best homemade spaghetti and meatball recipes I have had. I used home canned roasted tomatoes for the sauce, and tons of fresh herbs to add some delicious flavor to the meatballs. This recipe also makes fabulous leftovers. *If you don’t have any home canned tomatoes on hand, then use a very high quality store bought variety, such as Muir Glen roasted diced tomatoes, and add 2 minced cloves of garlic. Recipe adapted from Cooking Light Spaghetti & Meatballs. To prepare sauce, heat 1 tbsp oil in a medium saucepan over medium heat. Add onion and saute for 5 minutes. Add canned tomatoes, wine, crushed red pepper, and salt. Stir and bring to a boil. Reduce heat to medium low and simmer until reduced by a third (about 45 minutes). Stir occasionally. To prepare meatballs, place bread in a food processor, and process until fine crumbs measure 1/2 cup. Combine the breadcrumbs, sausage, 1/2 cup onion, and next 8 ingredients (through sirloin) in a bowl. With wet hands, shape sirloin mixture into 34 meatballs. Place meatballs on a broiler pan. Broil 15 minutes or until done. Add meatballs to sauce; simmer 15 minutes. Sprinkle with 1/2 cup parsley and 1/3 cup basil. Serve over spaghetti. Sprinkle with cheese. Serve with fresh baguette, and a simple green salad if desired.